How do we sort wheat from chaff to find what’s usable? – Ashley F.
This chapter of Trusting The Untrustworthy was a pretty hard chapter for me to understand. It started of in 1994 with Nina Desai and her creation of “test-tube babies.” This is a line which supposedly was a line of human cells from a women’s womb and they were coaxed to grow in the lab. To Christopher Korch this seemed weird, later he found out that normal coaxed cells can’t grow for too long if not they start to spread out and the became immortal, which is not good. Then these cells started being used as lab tools. Then they noticed that they kept dividing. 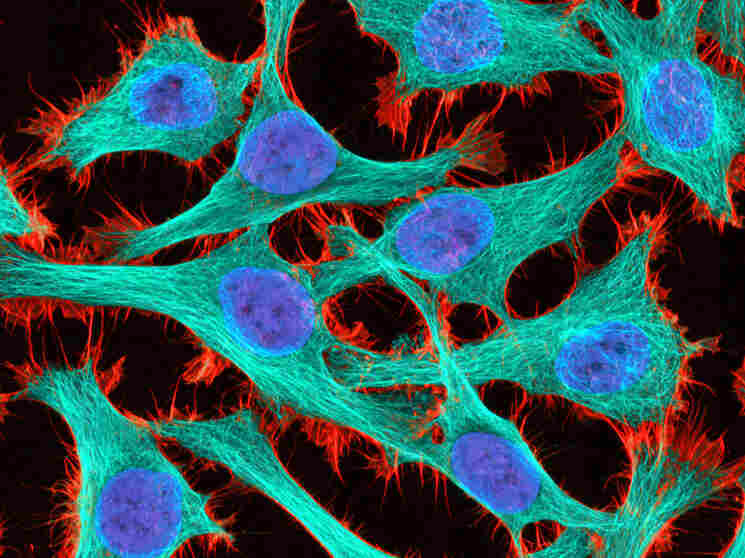 Later it moved on to be the immortal cell line know as HeLa cells which grow quick. Later on these cells started to be identified in many test, like KB cells, HE-p-2, Chang liver, WISH cells and probably many more. There was more than 7,000 studies published that were actually about HeLa, which was all an estimated cost of more than 700 million dollars. Later on people kept using it and other people on kept finding misidentified cells in work. Later on, they did research on a women who was diagnosed with early-onset breast cancer. They collected some of the fluid that had been building up around her lungs. They took them and later on labelled them as MDA-MB-435. They later practiced it on mice and they saw that it spread the same as it did on people which was good for them. They then studied samples and then selected one of sixty key lines and they would be used to test different potential cancer drugs. Yet it turned out that MDA-MB-435 was an imposter. This was taken on after Doug Ross was trying to figure out the genes, which were on or off. Later on they could identify the type of cancer it was by looking at the patterns of the genes. They had noticed how breast cancer was different from what they had found earlier which was the early-onset breast cancer. They realized it was melanoma, and for many researchers this was horrible for them. It meant that all the hard work and money they had put into it was fake and useless. This didn’t stop anyone though, people kept using this method and calling it as the search for the cancer cure. Later on they were using KB cells because they thought that maybe they could pull something out from the wrong research they had made, later on they went to realize that the KB cells was actually HeLa. To Gottesman it didn’t matter, “We we’re not particularly interested in the origin of the tumor, we just wanted a cancer cell line. It had the properties we wanted” said on page 103. A lot of people did agree that maybe the whole research wasn’t complete waste but they didn’t know how to distinguish the good from the bad. From all of this I am amazed on how a scientist says the wrong they did, that they have the courage to unmask their own colleagues. That after all the mistakes of science were told people still kept using them and acting as if they had something different as if they had a different “ingredient” from everyone else that made they’re whole research more true and believable. As the last paragraph on page 122 said, “Improving experimental design would further reduce these unforced errors in science. But carefully designed and executed experiments are still worthless unless their results are analyzed with care.” This stood out to me as something strong to write at the end of the chapter because, it’s saying that changing the design on an experiment can change the mistakes and errors from before but it won’t be useful if the experiment isn’t handled with care. That’s all that science takes, to handle with care. Yet these lies about cure seem to be spreading faster than the actual cancer, and it’s great that someone can come out and write a book and for scientist to actually support the author. Cell Lines are Cell Lies- Anne K.